Join us on April 13, 2019 at 7:00 PM for our next concert. Many Moons marks the passing of time and cycles of change. This concert will be the last with our founding artistic director Jessica Corbin at the helm. For the past 18 years, her creativity and vision has led BVS Women’s Choir to take on ambitious repertoire and collaborations. She grew BVS from a high school girls choir to an intergenerational women's choir that has performed not only in New York, but also in El Paso, Seattle, and Portland, building relationships with communities in Brooklyn as well as other women's choirs, performers, and composers. Join us this spring to celebrate the years Corbin has led BVS, and her evolving but consistent commitment to performing work written for women's voices, often by living women composers. 119 Pierrepont Street, Brooklyn Heights. 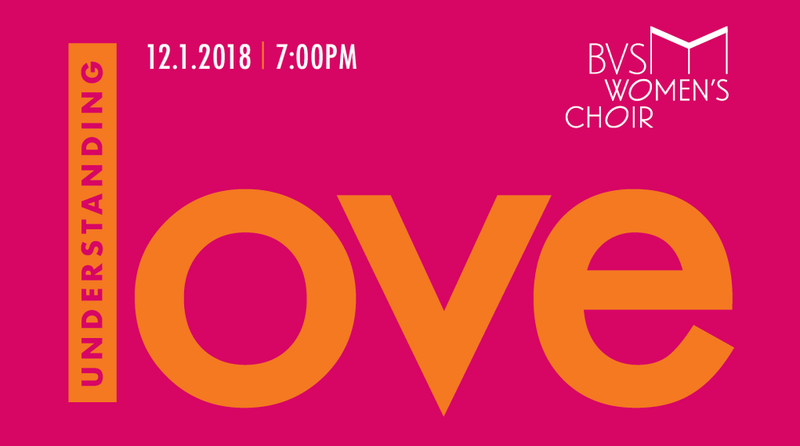 Understanding Love was BVS’ 2018 Fall/Winter concert. The pieces explored the different concepts of love, as well as the theme of acceptance. Our featured composers included Joan Szymko, Craig Hella Johnson, and Jocelyn Hagen, plus the premiere of a piece by BVS Assistant Conductor Melanie Cozzi. You can see the full program here.